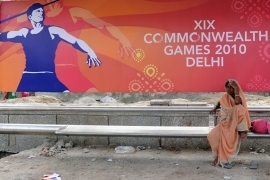 As I write this commentary, the media of the big Commonwealth countries are lambasting India over the preparations for the Commonwealth Games due to start in New Delhi on October 3. Much of the criticism is unfair and unhelpful. India has just endured a dreadful monsoon season which delayed construction work. That was followed by an outbreak of dengue fever in Delhi, the Indian Capital and the location for the games. There are, therefore, some good reasons for the poor state of part of the accommodation for athletes from 54 independent Commonwealth countries and dependencies such as Bermuda and the British Virgin Islands. Not enough attention has been paid by the critics to these circumstances. Much has been made of the collapse of a footbridge under construction near the Jawaharlal Nehru Stadium, the main Games venue. Yet, the collapse was due to an engineering issue and it has no impact on the games' main venues. The state of the athletes' Village has also been heavily criticised with complaints of flooding, rooms soiled with excrement and stray dogs found on some beds. Little account was taken of the recent monsoons and flooding that occurred carrying waste into the Village, and, importantly, that these are problems that could be fixed. It is worth remembering that India is home to some of the world’s most luxurious hotels, where cleanliness, hygiene and excellent service have received international acclaim. Some commentators have gone further to suggest that the problems India faces are good reasons why major sporting events should not be held in developing countries. They seem to have forgotten, conveniently, China’s breathtaking showing as host of the 2008 Olympic Games and South Africa’s marvelous performance as host of the 2010 Football World Cup Tournament. They have also overlooked that India has spent $3 billion preparing for the games. Among the things it has successfully done are installing new infrastructure at the international airport in Delhi and a new metro. This is not to say that the Organizers of the Games ought not to have been more vigilant and that the government of India, recognizing that the eyes of sports lovers all over the world would be upon them, should not have more zealously overseen the arrangements. But, the Indians themselves have been alive to delays in construction and poor work in some places. The vigorously independent Indian media has regularly dispensed its own share of harsh criticism of the organizers and the government. Both the Times of India and the Hindustani Times showed that the majority of Indians are deeply embarrassed by reports of poor preparation of athletes’ accommodation. The newspapers themselves took a hard line. For instance, The Times of India headlined one story: “Commonwealth Games, India’s shame”. Obviously, since India took on the obligation of hosting the Commonwealth Games, Indians wanted the best possible portrayal of their country to the world. The widespread sense of embarrassment is understandable; it should be treated sympathetically and encouragement given to India’s desire to display itself in the best possible light. The government has responded to the complaints with decisive action. Prime Minister Manmohan Singh summoned the Sports Minister, M S Gill, and the Urban Development Minister, Jaipal Reddy, to a meeting whose consequence was the deployment of even more resources to ensure that all problems with the athletes’ accommodation are corrected on time. Security concerns have also been raised particularly about the safety of athletes. Yet, the security arrangements fully measure up to international standards. They include: a three-tier security around all competition venues, helicopter surveillance, over 2,000 Close Circuit Televisions to monitor every movement around important locations and special vehicles to transport guests. Athletes will be looked after by a team of dedicated security personnel drawn from the Delhi Police Force and the paramilitary forces, and the vehicles transporting them will undergo mandatory anti-sabotage clearance every morning. Indian security forces are also accustomed to handling large crowds. Some events in India attract up to 60 million people. No other country in the world can make a similar claim. For these reasons, the athletes who have pulled out of the games have shown extremely feint hearts. If they fear terrorists, they would have better reason to harbor such fears in London at the 2012 Olympic Games which will undoubtedly be a target for extremists. On the other hand, if it is hygiene that is the issue, they also face that problem in any number of restaurants around the world whose kitchens occasionally lapse. Fears were also expressed about South Africa’s readiness to hold the 2010 World Cup Football Tournament. Today, few have reason to criticize South Africa. In the end, India will correct the deficiencies and get it right. The country has more than enough organizational, technological, and creative talent to ensure the success of the Games. What the government must do now is to pull all that talent together to showcase the country’s capacity. These Commonwealth Games are significant to India as host, but they are also important to the Commonwealth as an association of 54 states that have valued their close relations for over 60 years, and who believe that, collectively, they have a unique contribution to make to global understanding. The Commonwealth represents one-third of all mankind and it straddles every continent in the world; its people are of all races and religions; and its countries are large and small, rich and poor. The Games are a traditional celebration by its athletes of their fierce but friendly competition. It is also beneficial preparation for the Olympics. It would be good if Jamaica’s Usain Bolt would reconsider his decision not to participate in the Games. His presence would be a vote of confidence in the capacity of developing countries such as those in his native Caribbean. It would be a gesture that India would greatly appreciate and remember. Whether Bolt reconsiders or not, all Commonwealth countries should give every support and encouragement to India, stop the undignified carping and let the Games begin.